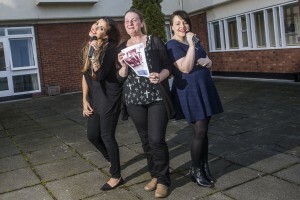 Care home staff to rock against dementia | News by Wales Express News, People Before Profit! Musical care home staff are going to rock against dementia – including a singer who shared a stage with Pixie Lott. Pendine Park staff planning a charity rock night. From left Olivia Thomas, Anita Moran and Bethan Williams. The melodic group from Pendine Park care organisation in Wrexham will be singing their hearts out at the town’s Commercial pub at 7.30pm on Saturday, March 21. They’ll be performing an energetic mix of pop, indie, R n B, and rock at the Rock against Dementia concert and entry costs £3. All of the proceeds will go to Dementia UK to raise awareness of the condition and support the work of Admiral Nurses, who are specially trained look after people who have it. On the bill is Olivia Thomas, 26, an activities and wellbeing coordinator at Pendine Park and one fifth of girl-band Indigo City, who once shared a stage with pop princess Pixie Lott at Chester Rocks. Olivia said: “That day was a blur. I felt famous. We were in the backstage area with all of the celebrities, and you felt like you were one of them. “Pixie Lott was really nice. I felt nervous performing to all of those people but then as soon as I walked on stage I was fine. “I can’t wait for Rock Against Dementia. It’s going to be a fantastic night and it’s for a brilliant cause that’s close to all of our hearts here at Pendine Park. “We’re also going to have a raffle, and there will be plenty of prizes. “Music is very important to what we do here at Pendine Park. It’s part of our enrichment programme. Performing on the night will be Olivia’s boyfriend Rob Hanaghan, 26, an engineer from Neston on the Wirral, who will be playing an acoustic version of Purple Angel, a dementia awareness campaign song written by Pendine Park staff member Tracey Green. Care practitioner Bethan Williams, 23, who works at Pendine Park’s Hillbury care home, is also going to be singing on the night. Dementia is a common condition that affects about 800,000 people in the UK. It is a syndrome associated with an on-going decline of the brain and its abilities. This includes problems with, memory loss, thinking speed, mental agility, language, understanding and judgement. Helping to arrange the event is Anita Moran, activities and well-being coordinator at Pendine Park’s Hillbury care home. She is the first person in Wales to become an ambassador the worldwide Purple Angels dementia campaign. Anita was inspired to join the Purple Angels campaign, which has spread to 79 countries, by the experience of her late father Barry. She said: “Music can change people’s moods. If they’re feeling a bit sad then music can make them happy. “Rock Against Dementia is just a way of using music, poetry and the arts to raise awareness of dementia, and how the arts can help people with the condition.